Hidden Gem!!! Rare property nestled in beautiful Estero West of 41. 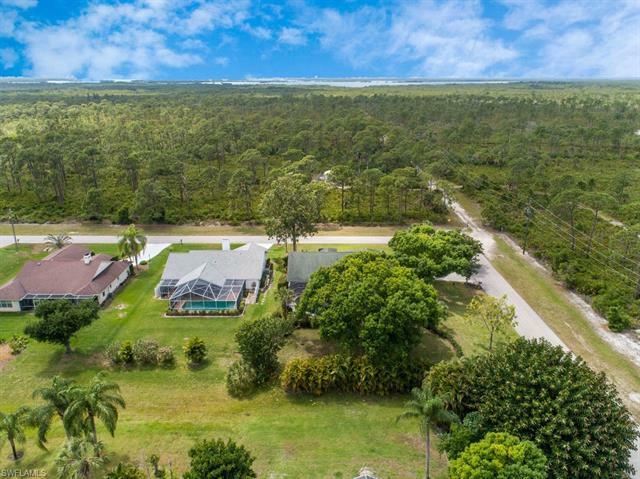 Nicely situated on a private corner lot facing Estero's beautiful nature preserves on two full sides of the property. Very well maintained with a spacious floor plan, high ceilings, great outdoor lanai space with easy access to the kitchen, dining room, master and even a pool bath. Beautifully upgraded pool and oversized travertine deck, mature landscaping for your added privacy and tropical oasis feel. This home has lots of upgrades including extensive upgraded tile, hardwood floors, beautiful custom closets, oversized bedrooms and closets as well...the list goes on. Updated hot water heater in 2015, complete AC system and ductwork replaced in 2017, upgraded kitchen with Fischer and Pikel appliances, quartz countertops, hard to find gas range with hood....this house is perfect for families and perfect for entertaining! Features a yard that you just wont find in booming Estero and especially West of 41. Central location but nicely tucked back from the heart of town. Low HOA fees of $100 per year!!!... just one of those hard to find nice 'neighborhoods' in Estero where you can bring your toys and enjoy some privacy.